THE HUMANITY OF JESUS CHRIST. 1. THE SCRIPTURES DISTINCTLY TEACH THAT HE HAD A HUMAN PARENTAGE: THAT HE WAS BORN OF A WOMAN--THE VIRGIN MARY. In thus being born of a woman Jesus Christ submitted to the conditions of a human life and a human body; became humanity’s son by a human birth. Of the “seed of the woman,” of the “seed of Abraham,” and of line and lineage of David, Jesus Christ is undeniably human. We must not lose sight of the fact that there was something supernatural surrounding the birth of the Christ. Matt. 1:18--“On this wise,” and Luke 1:35--“The Holy Ghost shall come upon thee, and the power of the Highest shall overshadow thee; therefore also that holy thing which shall be born of thee shall be called the Son of God.” ‘On this wise” indicates that this birth was different from those recorded before it. Luke 1:35 is explicit about the matter. To assail the virgin birth is to assail the Virgin’s life. He was of “the seed of the woman,” not of the man. (See Luke 1:34--“How shall this be, seeing I know not a man?”) No laws of heredity are sufficient to account for His generation. By a creative act God broke through the chain of human generation and brought into the world a supernatural being. 2. HE GREW IN WISDOM AND STATURE AS OTHER HUMAN BEINGS DO. HE WAS SUBJECT TO THE ORDINARY LAWS OF HUMAN DEVELOPMENT IN BODY AND SOUL. Just to what extent His sinless nature influenced His growth we may not be able to say. It seems clear, however, from the Scriptures, that we are to attribute Jesus' growth and advancement to the training He received in a godly home; to the instruction given at the synagogue and the temple; from His own personal study of the Scriptures, and from His fellowship and communion with His Father. Both the human and divine element entered into His training and development, which were as real in the experience of Jesus as in that of any other human being. We are told that “Jesus grew, and increased in wisdom and stature.” He “increased,” i.e., He kept advancing; He “grew,” and the reflective form of the verb would seem to indicate that His growth was due to His own efforts. From all this it seems clear that Jesus received His training along the lines of ordinary human progress--instruction, study, thought. Nor should the fact that Christ possessed divine attributes, such as omniscience and omnipotence, militate against a perfectly human development. Could He not have possessed them and yet not have used them? Self-emptying is not self-extinction. Is it incredible to think that, although possessing these divine attributes, He should have held them in subjection in order that the Holy Spirit might have His part to play in that truly human, and yet divine, life? 3. HE HAD THE APPEARANCE OF A MAN. The woman of Samaria evidently recognized Jesus as a Jaw by His features or speech. To her He was just an ordinary Jew, at least to begin with. There is no Biblical warrant for surrounding the head of Christ with a halo, as the artists do. His pure life no doubt gave Him a distinguished look, just as good character similarly distinguishes men today. Of course we know nothing definite as to the appearance of Jesus, for no picture or photograph of Him do we possess. The apostles draw attention only to the tone of His voice (Mark 7:34; 15:34). After the resurrection and ascension Jesus seems still to have retained the form of a man (Acts 7:56; 1 Tim. 2:5). 4. HE WAS POSSESSED OF A HUMAN PHYSICAL NATURE: BODY, SOUL AND SPIRIT. By his incarnation Christ came into possession of a real human nature; He came not only unto His own, but came unto them in the likeness of their own flesh. Of course we must distinguish between a human nature and a carnal nature. A carnal nature is really not an integral part of man as God made him in the beginning. Christ's human nature was truly human, yet sinless: “Yet without sin” (Heb. 4:15). 5. HE WAS SUBJECT TO THE SINLESS INFIRMITIES OF HUMAN NATURE. Matt. 4:2--“He was afterward an hungred.” John 19:28--“Jesus....saith, I thirst.” 4:6-- “Jesus....being wearied with his journey.” Matt. 8:24--“But he was asleep.” John 19:30-- “He bowed his head, and gave up the ghost.” He mourns over Jerusalem (Matt. 23:37); weeps over His dead friend Lazarus, (John 11:35); craves for human sympathy in the garden (Matt. 26:36,40); tempted in all points like as we are (Heb. 4:15). There is not a note in the great organ of our humanity which, when touched, does not find a sympathetic vibration in the mighty range and scope of our Lord’s being, saving, of course, the jarring discord of sin. But sin is not a necessary and integral part of unfallen human nature. We speak of natural depravity, but, in reality, depravity is unnatural. God made Adam upright and perfect; sin is an accident; it is not necessary to a true human being. 6. HUMAN NAMES ARE GIVEN TO HIM BY HIMSELF AND OTHERS. No less than eighty times in the Gospels does Jesus call himself the Son of Man. Even when acquiescing in the title Son of God as addressed to Himself He sometimes immediately after substitutes the title Son of Man (John 1:49-51; Matt 26:63,64). While we recognize the fact that there is something official in the title Son of Man, something connected with His relation to the Kingdom of God, it is nevertheless true that in using this title He assuredly identifies Himself with the sons of men. While He is rightly called THE Son of Man, because, by His sinless nature and life He is unique among the sons of men, He is nevertheless A Son of Man in that He is bone of our bone and flesh of our flesh. 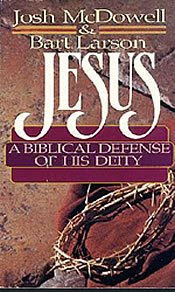 The articles on Christology from “Jesus: A Biblical Defense of His Deity” by Josh McDowell and Bart Larson are part of the interim curriculum. We have prepared these study guides which you can use in two ways: (1) Read the study guide first so you can have an overview of the article; and (2) After reading the article, try answering the study guide questions to test your comprehension. Online, interactive quizzes with automatic scoring are also available. What Are Some Common Objections to the Deity of Christ? Is Jesus Christ Your Lord? Christology: Jesus Christ, by Greg Herrick Th.M., Ph.D.
That was the true Light, which lighteth every man that cometh into the world. He was in the world, and the world was made by him, and the world knew him not. He came unto his own, and his own received him not (John 1:9-11).